While hiring the right contractor to handle your roof installation is one of the major keys to a long-lasting roof, keeping up on roof maintenance can be just as important. Capital Coating, Inc. is the top choice for clients in Gaithersburg, MD in need of some expert roofing help. Set up a free roof inspection today by giving us a call at (717) 442-0979. For the past 25 years, our roofing specialists have delivered fantastic project results for many different clients. This amount of team experience is rare when it comes to commercial roofing companies. From our craftsmen down to our customer service, Capital Coating, Inc. offers the best around. In order to keep up on any necessary roof maintenance, roof inspections play an important role. Capital Coating, Inc. offers free roof inspections to our local clients. With experience working on all types of commercial roofs, our team is qualified to seek out any existing or developing issues on your roof. There are many different types of commercial roofing systems out there. On top of that, every roof is unique. The specific climate, sun exposure, age of the roof, and other factors all affect how much work a roof needs. At Capital Coating, Inc., we pay attention to all the small details and design customized roof maintenance plans for our clients. By sticking with one of our roof maintenance plans, your roof will get the services it needs exactly when it needs them. Timely repairs can really help extend the life of a roof which is why it is always best to take care of roof leaks as soon as possible. With the help of Capital Coating, Inc., you will save a significant amount of time and money on your roof because we will keep it in great condition for significantly longer. Capital Coating, Inc. holds an exceptional reputation in Gaithersburg, MD. Clients appreciate our timely project completion, low prices, and knowledgeable roofing specialists. We offer roof maintenance plans that can add decades to your roof. You can reach us at (717) 442-0979 to hear more about our cost-effective services. It’s no secret that the longer your roof lasts, the more money you save. Roof replacements are expensive — you’re far better off maintaining the roof that you already have for as long as possible. The first step to extending the life of your roof is to get regular roof inspections. Capital Coating, Inc. provides this service and much more to clients in Gaithersburg, MD. To set up a free roof inspection today, call Capital Coating, Inc. at (717) 442-0979. The team at Capital Coating holds decades of experience in the roofing industry. This means that we have diagnosed and repaired many types of roof issues over the years. 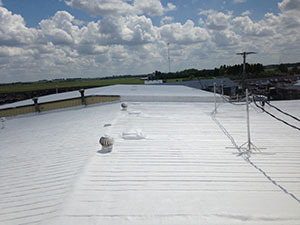 Our experienced team is qualified to provide thorough and effective roof inspections on all kinds of commercial roofs. Without regular roof inspections, a roof is unlikely to reach its maximum potential. It’s not enough to just get your roof fixed when you notice that it’s leaking. 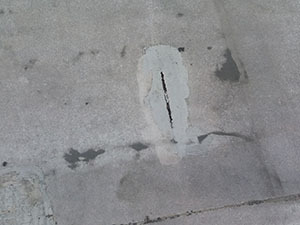 Eventually, these leaks and the deterioration to your roof’s membrane will force the need for a roof replacement. However, with regular roof inspections, many leaks can be prevented altogether, and your roof will be kept in solid condition for far longer. When you choose Capital Coating to inspect your roof, all the boxes will be checked. Our roofing specialists will look at your roof’s gutters, flashing, seams, and much more. We’ll stay a step ahead of any developing problems so that you won’t need to deal with the costly effects of water damage. In general, we think two roof inspections per year is a solid schedule for any roof. This is frequent enough to catch developing problems early on which will save you from having to pay for costly repairs. Usually, it’s best to have an inspection before and after each winter, especially considering the rough climate in the Northeast. If Capital Coating, Inc. seems like a good fit for you, you can reach us today at (717) 442-0979. We’ll come by shortly after and give your roof a complete roof inspection. Our roof inspections will have your roof lasting far longer and will help you save a significant amount of time and money. Capital Coating, Inc. is truly the go-to roofing company for clients in Gaithersburg, MD. Capital Coating, Inc. is the leading commercial roofing company for the people of Columbia, MD. We offer effective roof inspections and roof leak detection to pinpoint leaks and fix them in a timely manner. To get started, give us a call today at (717) 442-0979. At Capital Coating, Inc., all of our services are thorough. There are many ways to check for roof leaks. We’ll check from inside the attic to help pinpoint exactly where water is getting in. With our accurate roof leak detection, you’ll be able to save a good deal of money because your roof will be repaired properly on the first attempt. You can get many more years out of your roof if you have it inspected before and after each winter. These inspections will allow our skilled roofing specialists to stay on top of any needed repairs and maintenance which will keep your roof in great condition for much longer. 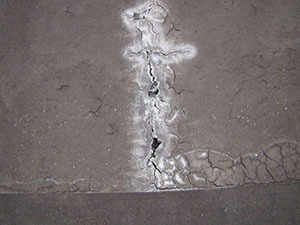 Locating and repairing roof leaks early on can really spare you from costly future issues. If your roof is leaking, it may be because it has started to deteriorate with age. If this is the case, restoring your roof could very well be the most cost-effective option. At Capital Coating, Inc., we can restore your roof at a great price with a roof coating. A roof coating is a thin protective layer that will greatly improve the strength of your roof. A roof coating is well-worth the price because it can easily squeeze an additional 10+ years out of your roof. Not only that, but the reflectivity of one of our roof coatings will cut down on your energy costs. Of course, we may discover that your roof would be better off being repaired or replaced. As a full-service roofing company, you can rely on us for whatever it is your roof may require. Capital Coating, Inc. is a dedicated team of roofing specialists with heaps of experience in roof leak detection. We help clients in Columbia, MD get more years out of their roofs. When you’re ready to schedule a roof inspection from a trusted contractor, call us at (717) 442-0979. 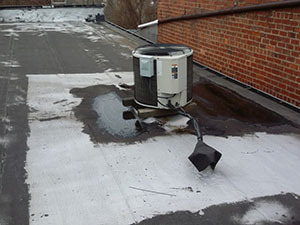 A roof leak can be a distraction to the happenings in any commercial building. Not only that, but the longer you wait to have it repaired, the messier the situation can get. 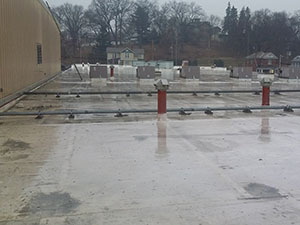 If you have a commercial building in Easton, PA that could use a rubber roof repair, Capital Coating, Inc. is the company for you. Reach out to us at (717)442-0979 to set up a free roof inspection. When it comes to dealing with roof leaks, you want a company that can thoroughly inspect your roof and get down to the root of the issue quickly. 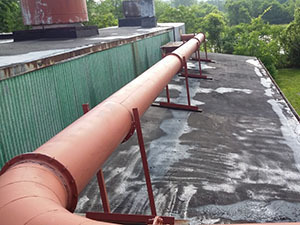 At Capital Coating, Inc., our roof leak detection is extremely effective. This means that when you hire us, your roof leak(s) will be dealt with properly and you won’t have to worry about call backs or premature roof replacements. We didn’t get to the level we are at overnight. Our company has been around since the 1990’s, and our roofing specialists had many years of experience before that as well. With us, you get high-quality roofing services at low prices as well as top of the line customer support. We’ll start off by inspecting your rubber roof. If you don’t already, we recommend scheduling roof inspections a couple of times per year in order to prevent roof issues from coming to fruition. 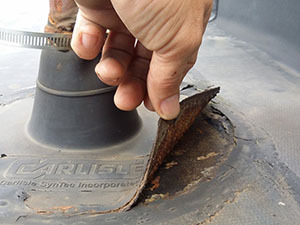 We do a thorough check of the condition of your rubber roof’s membrane and pay close attention to its seams. 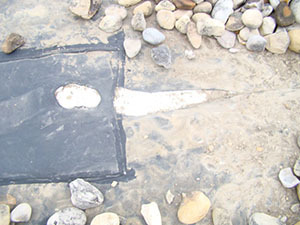 Once we’re sure we’ve found where the water is getting in, we’ll repair your rubber roof in no time. Our repairs hold up for the long run so you can count on us to get rid of those leaks that just seem to keep coming back. We also offer high-performance roof coatings that will have your roof watertight and your building more energy-efficient. The roofing specialists at Capital Coating, Inc. look forward to helping more clients in Easton, PA save money on their roofs. To get a rubber roof repair, you can reach us at (717)-442-0979. We offer a range of cost-effective roofing services. The knowledgeable team at Capital Coating, Inc. takes the stress off the backs of clients who need work done on their roofs. Roof leaks can be difficult to find which can lead to costly water damage and premature roof replacements. Our comprehensive roof leak detection will expose all leaks and put our roofing specialists in a position to fix them permanently. For a leak-free roof, call Capital Coating, Inc. today at (717) 442-0979. As you already know, a new roof is a costly investment. In order to protect this investment and get your full money’s worth out of it, certain measures should be taken to ensure that it lasts as long as possible. With regular roof inspections and timely roof repairs, a roof’s lifespan can be doubled. When your roof is leaking, the longer you wait the more damage that leak can inflict on the interior of your building as well as the roof itself. This will wind up costing you more on repairs and can potentially force the need for a roof replacement. To avoid these problems, hire Capital Coating, Inc. for regular roof inspections and repairs. Finding a leak early on can be the difference between a roof that gets replaced and a roof that lasts for another 10+ years. When we inspect your roof, we check the entire membrane for leaks and check for loose flashing, seam separation, and ponding water. Moreover, we’ll look at the ceiling/attic within your building to get a better idea of where water is getting in. If your roof is leaking, we offer long-lasting repairs, maintenance, and roof restoration services. We can add a roof coating to further protect your roof. With a roof coating, your roof is likely to last over ten years longer. Capital Coating, Inc. has the number one roofing team available to clients in Gaithersburg, MD. Our company is adept in roof leak detection along with roof repairs and any of the other services that may need to follow. For a roof inspection or a free estimate, give us a ring today at (717) 442-0979. Capital Coating, Inc. has built an exceptional reputation in Gaithersburg, MD. With our reliable roofing specialists and our helpful customer support, working with us can be a breath of fresh air compared to other companies in the area. We specialize in all aspects of commercial roofing, including single-ply roofing. Whether you are looking for a single-ply roofing repair or replacement, give us a call at (717) 442-0979. When it comes to environmentally-friendly roofing systems, it doesn’t get much better than TPO single-ply roofing. TPO roofing systems significantly lower energy costs. Plus, they are one of the most weather-resistant flat roofs out there. There is a lot of debate between PVC and TPO roofing systems. While TPO has a bit of an edge when it comes to weather resistance and energy-efficiency, PVC has superior chemical resistance and flexibility. Also known as rubber roofing, this type of single-ply roofing is a popular choice due to its affordability and durability. Furthermore, EPDM roofs are low maintenance and work well on large rooftops because they can cover large areas with very few seams. The surface of these roofs deal with the sun well which will help improve the energy-efficiency of your building. The three options listed above are only a few of the many kinds of single-ply roofing systems available. We’ll be happy to help you decide on one by answering any of your questions and providing you with a recommendation after we’ve heard more about your building and budget. We’re a full-service commercial roofing company that has been around since the 1990’s! The roofers at Capital Coating, Inc. are single-ply roofing experts. 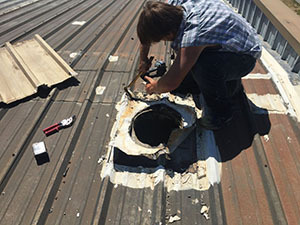 If you have a commercial building with single-ply roofing in Gaithersburg, MD that needs a repair or a replacement, we’re the top choice around. To begin working with us today, give us a call at (717) 442-0979. A rubber roof is one of the best value roofs on the market. It’s affordable and can cover large surfaces with very few seams. 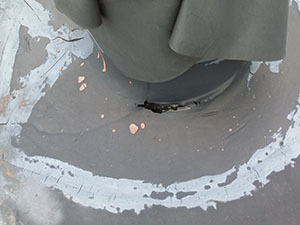 However, like any roof, even a durable rubber roof will leak from time to time, especially as it tacks on the years. 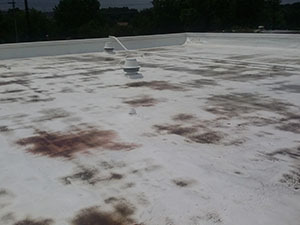 If your building in Gaithersburg, MD needs a rubber roof repair, you can call Capital Coating, Inc. at (717) 442-0979. Rubber roofs, AKA EPDM, are one of the most common kinds of commercial flat roofing systems. This kind of roof is known for its ability to hold up in all types of weather. In comparison to other materials, rubber roofing is also quite affordable. Plus, EPDM roofs can be fully recycled. If you have a rubber roof, you should have it inspected each year, ideally before and after each winter. Even if nothing seems to be wrong with your roof, these inspections will allow the experts at Capital Coating, Inc. to keep an eye out for any problems that are just beginning to develop. By catching something like seam separation early, you’ll avoid having to pay for nasty water damage repairs. After we’ve inspected your rubber roof, our roofing specialists will patch up any leaks and leave your roof as good as new. Our company has been providing clients with high-quality repairs for decades so you can trust us to get the job done right on the initial visit. 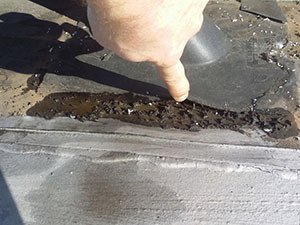 If your rubber roof seems to be taking a turn for the worse, we also offer rubber roof restoration and rubber roof replacements. When you hire Capital Coating, Inc., you can expect personalized roofing solutions, reliable customer service, and high-level craftsmanship. There’s a reason why we hold one of the best reputations in the Northeast. Trust our team for routine maintenance and inspections to get many more years out of your rubber roof. 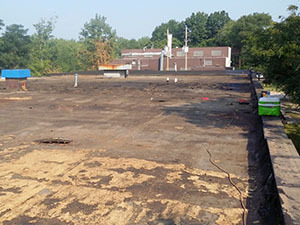 Capital Coating, Inc. has been working with rubber roofs since the 1990’s. To schedule a rubber roof repair in Gaithersburg, MD, you can reach us at (717) 442-0979. We can also help you with rubber roof installation, replacements, and much more. When it’s time for a new flat roof, it makes more sense than ever to hire the top roofing company around. After all, the quality of a flat roof’s installation is a huge determinant of how long that roof will last. 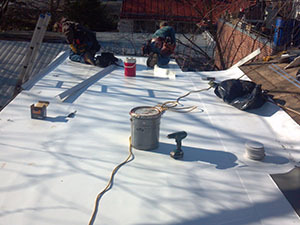 Capital Coating, Inc. offers high-quality flat roof replacements to clients in Gaithersburg, MD. For a free quote on a new flat roof replacement, give us a call at (717) 442-0979. 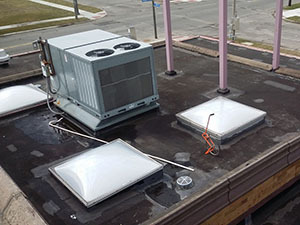 There are many reasons why flat roofs are so common on commercial buildings. Aside from being extremely cost-effective, they are also low-maintenance, lightweight, and durable. Of course, there are now many different kinds of flat roofs to choose from. Capital Coating can install any kind of roof that you’d like. 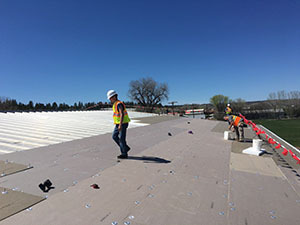 We have years of experience working with EPDM, TPO, PVC, and many other types of flat roofs. Our team of certified technicians are all fully insured and licensed. We have over two decades of service records and we have become known for our innovative residential, industrial, and commercial roofing solutions. Capital Coating is a full-service roofing company that does everything from flat roof replacements to basic flat roof repairs. Once we’ve installed your new flat roof, we recommend using us to inspect your flat roof on a regular basis as the years go by. This is the best way to extend the life of your roof because the experienced roofers at Capital Coating will be able to effectively maintain the condition of your roof through regular inspections. With these inspections, we will be able to catch problems early and often prevent them altogether. Plus, the Capital Coating team will know how to get more years out of your roof by getting it timely roofing services. This may include restoring your flat roof with a roof coating which can give your flat roof an additional 10+ years of leak-free protection. Capital Coating, Inc. handles all types of roofing services for clients in Gaithersburg, MD. Choose Capital Coating for exceptional workmanship, customized roofing solutions, and great prices. Whether you would like to schedule a flat roof replacement, a roof coating, or some other type of service, give us a call today at (717) 442-0979. How many commercial roofing companies have you worked with in the past? Capital Coating, Inc. is the permanent solution to all your future commercial roofing needs in Gaithersburg, MD. We’re a versatile company with an appealing blend of low prices and high-quality services. To get your roof back into top condition, reach out to us at (717) 442-0979. Deciding on a commercial roofing company to take care of your roof is an important choice. A roof is a valuable asset and the commercial roofing company that you elect to install, repair, restore, or replace it can make a big difference in terms of how much you spend on your roof. There are plenty of commercial roofing contractors around, but few have the experience or the quality team members that we have here at Capital Coating, Inc.
Our company was founded by Mervin Fisher way back in the 1990’s. Over all those years, we still uphold a pristine reputation in the Northeast. Before branching off to start Capital Coating, Inc., Mr. Fisher had over 10 years of tutelage in the roofing industry under his father. Our company was built on a solid foundation of extensive roofing knowledge and excellent values. Working with us is easy. Not only is our customer service friendly and reliable, but we also offer timely roof inspections free of charge. 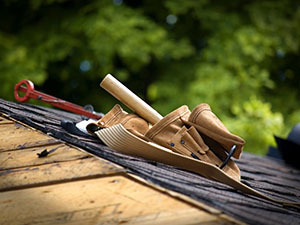 Our thorough roof inspections will get to the true root of your roof’s issues. This makes the follow-up services more efficient, affordable, and effective. Some roofing companies only handle specific roofing services. Juggling different contractors for different services over the years can be a pain. As a full-service roofing company, you can rely on Capital Coating, Inc. for whatever it is your commercial roof may need. Our knowledge and experience working with the many varieties of commercial roofing systems makes us a great fit for clients across Maryland. There are many commercial roofing companies providing services in Gaithersburg, MD, but Capital Coating, Inc. stands out with excellent prices and a team of skilled craftsmen. Get in touch with us today at (717) 442-0979 to find out more. We’ll give you a no-obligation estimate on your commercial roof. If you’re dealing with a leaking flat roof in Gaithersburg, MD, Capital Coating, Inc. has your back. With over 20 years of service records and a team of certified roofing technicians, we’re the top team around to trust with a flat roof repair. To schedule one today, give us a call at (717) 442-0979. In the 1990’s, Capital Coating, Inc. was formed by Mervin Fisher who had already had over a decade of roofing experience prior to starting the company. We’ve now compiled a full team of roofing specialists who are honest, hardworking, and dedicated to providing high-quality roofing services. 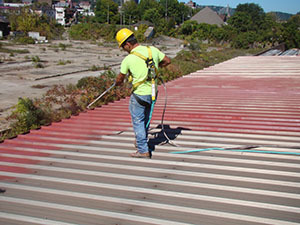 Capital Coating, Inc. now holds one of the best reputations amongst commercial roofing companies in all the Northeast. If you suspect that your flat roof has a problem, it’s best to schedule a roof inspection as soon as possible. A leaking flat roof can cause a lot of water damage in a short amount of time. The experts at Capital Coating, Inc. will spot any problems and sort them out in the most effective way possible. 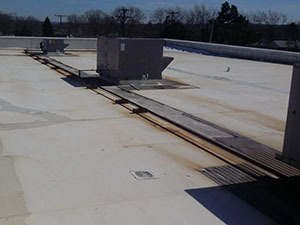 Whether there is a tear in the membrane or separation at the seams, we’ll fix all of your flat roof’s problems on the first visit so you can put them behind you. With a lesser contractor, there may be a much longer troubleshooting process due to a less thorough roof inspection. Hire Capital Coating, Inc. on the first go to save both time and money! If your flat roof does require a repair, the time might be right to restore it. Capital Coating, Inc. is known for restoring roofs effectively with high-performance roof coatings. One of these roof coatings will add a number of years to your flat roof while also making your entire building more energy-efficient. The roofing specialists at Capital Coating, Inc. look forward to taking on more jobs in Gaithersburg, MD. If your roof requires a flat roof repair, roof coating, or any other type of service, give us a call at (717) 442-0979. We’ll be happy to evaluate your roof for free and answer any of your questions.